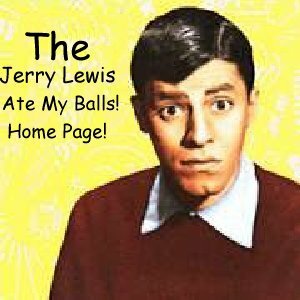 The Jerry Lewis Ate My Balls Homepage! Hey, Cool, You've found my Officially Unofficial Jerry Lewis Ate My Balls Page! This Page Was Inspired By "The Mr. T. Ate My Balls Page" and countless others, and you're gotta admit, they're pretty funny. Now before you go in, I just gotta say: If you get offended easily, say by things like farting on TV and such, then just don't go in! How'd you find this page anyways? If you want to send me mail, please, I encourage you to! Tell me how I'm doin' at this "Ate My Balls" Stuff! A sound file of Jerry Singing!!! Oh yea, one more thing, if you like this tasteless humor, go see my real homepage and sign my guestbook! Now, On to the ball eating! is owned and operated by Hung Truong.